Dave, Silvio, Keith, Dean and I were in attendance for the 44th meeting. It was great to see everyone for the first time in 2016. 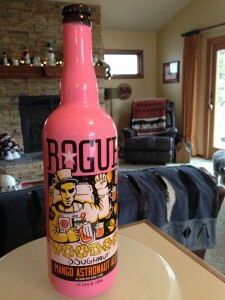 Since Pluto was discovered the day before on Feb. 18th, 1930 and my discovery was on the same day-of-year but in 1949, we celebrated with a bottle of Rogue “Mango Astronaut Ale”. 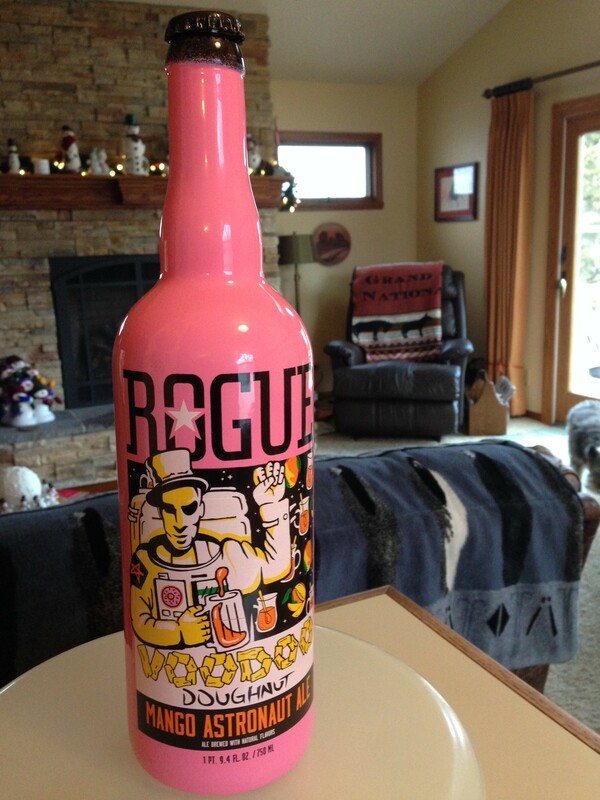 My son Curt had read about our beer tasting during the Plutopalooza Party in July and couldn’t pass up buying this aptly named pink bottle of libations for us. Keith, Dave and I sampled it and it was a three “thumbs up” rating. Now that I’m 2/3 of a century old, I can really appreciate a night of discussing new discoveries and anticipating coming milestones in Space & Astronomy with good friends. We opened the meeting with a music video from the group “OK Go”. They filmed the video on the “vomit comet” plane that makes steep dives to simulate 0-gravity. Their chorography was amazing. Word has it that the group threw up 58 times during its production. We also watched the trailer for the new movie, “Independence Day – Resurgence” that is due out this July. If it is comparable to the original, it will be a good movie to see this Summer. Lastly I mentioned the TV program “The Telescope” which airs Saturday night on the Discovery Channel and Sunday night on the Science Channel. We also discussed some of the troubles with SkyWatch at the Cernan Space Center now that they have a new director. I plan to call over there this coming week to stress what a phenomenal resource SkyWatch is for people that want to stay current on Astronomy & Space events. Each of the 5 astronomers brings his own expertise to the different segments of the monthly presentation. As a member, I’m disappointed the astronomers are not being treated as the resource that they are, that the yearly “Big Event” has been canceled and that they might close the gift shop associated with the planetarium. All these things seem to be happening without any information being distributed to members. Dave said he had access to a bus through his job for an overnight trip. Hopefully we will be able to organize an outing of some sort to a “dark site” for telescope observing and/or Yerkes Observatory in Wisconsin. In member news, Keith just became a grandfather for the second time but this time it is a grandson, Phil was celebrating his daughter getting an intership at Rush Medical Hospital and couldn’t make the meeting, Dean is close to becoming a licensed home inspector in Illinois, and I’m taking four more online courses with three in astronomy and one in Space Exploration and Rocket Science from the Universidad de Carlos III of Madrid, bringing my class total to 22 since Nov 2014. The 1st death by meteorite in 190 years – an Indian man, a bus driver, was killed by a 24# rock that made a 2 ft deep crater. It is the 1st death since 1825 and occurred in the SE section of country. NASA says they are not convinced at this point and are waiting futher proof. Edgar Mitchell the 6th man to walk on the moon on Apollo 14 dies at 85 – He went on to research paranormal phenomena and was a firm believer in extra-terrestrial life and often spoke about a government cover-up at Area 51. He flew to the moon with Alan Shepard. Of the twelve men who walked on the moon, only seven are still alive. Aldrin (Apollo 11), Bean (Apollo 12), Scott (Apollo 15), Young & Duke (Apollo 16) and Cernan & Schmitt (Apollo 17) are still living. My hope is that the US will land on the moon again before they all pass away. But because they are already in there 80’s, that is becoming less of a likelyhood each year that we don’t have a plan to do it. Will Mars or Venus kill you first? – pretty good video with a lot of info, part of the PBS series called “space time”; the 2nd video “should we colonize venus instead of mars?” is also informative. The bottom line is that one kilometer up in the Venus atmosphere seems to be an easier and more hospitable destination than the surface of Mars. New airlock proposed by Nanoracks for ISS – Would go on port side of Tranquility node after the PMA3 is moved to another port. Can open 12 times/yr. It can be detached with the robotic arm and deploys up to 192 cubesats. It also allows the repair of larger equipment because of its larger opening, The current Kibo airlock only opens 10 times/yr and only half of those open to NASA and its partners. It never realized that the opening of the airlock was so restricted. New ninth planet predicted for Solar System – video describing the discovery; Mike Brown predicted the planet based the on the orbit of 6 KBO’s including 2012 VP113 (80-446 AU out) and Sedna. He predicts a less than Neptune sized object should be found about 400-1500 AU out with mass 10x the Earth’s. It is super-Earth sized, all 6 objects are tilted down by 30 degrees and the orbits point in same direction There is only a 7 in 10,000 chance that this is a random orientation. Work begins on WFIRST (Wide Field Infrared Survey Telescope) – It will be the successor to JWST and investigate dark energy, exoplanets, galaxy formation Intented to fly in 2024. David Spergel is co-chair of science definition team. The telescope has a wide field of view (FOV) 200x Hubble and 100x JWST FOV but with the same 2.4m diameter. The telescope mirror was a gift to NASA from the National Reconnaissance spy Organization. Apparently they made a few too many mirrors for their spy satellites. It will also have a coronograph for exoplanet exploration. This type of telescope is listed as the top mission by the NRC decadal survey of 2010. Nice video describing capabilities. Final NASA budget bill fully funds commercial crew and Earth science – probably a lot of concessions had to be made but NASA finally got full funding of commercial crew which gives us the best chance of getting both SpaceX Dragon and Boeing CST-100 Starliner operationally flying by the end of 2017, 4 astronauts that will first fly on the capsules are pictured. Also great that earth science retained for the most part so that climate change can be monitored. $1.24B for commercial crew, $1.92B for earth science which is included in total science div of $5.6B which is $300M more than White House requested, hidden inside is $175M for Europa mission (launch on SLS by 2022) and $19.3B for NASA which is $756 over White House request and $1.27B more than 2015 (I’m sure SLS & Orion are part of the extra, yep, $2B for SLS, $300M more than 2015 and $644M more than White Houses request, $85M will go for advanced upper stage, gets lift capability from 70 to 105 metric tons, Orion gets $1.27B, $70M more than 2015). Vote on final bill later this week (12/14/15). Hurray!!!! They passed it. McCain mad at Shelby of AL and Durbin of IL for allowing ULA to purchase engines from Russia for another year for the Atlas V saying quote “real winner is Vladimir Putin and his gang of thugs running the Russian military-industrial complex”. 05-04 Planetary Society spin and table; More 2016 figures, NASA $19.3B increase of $750M over White House (WH) request of $18.5B and $1.2B over 2015, SLS, Orion, Commercial Crew and Planetary Sciences big winners, SLS gets $2B (WH asked for $1.36B) and $300M over 2015, Orion gets $1.27B an increase $70M over 2015, first SLS with unmanned Orion (EM-1) targeted for no later than Nov 2018, $85M for enhance cryogenic upper stage to replace Interim Cryogenic Propulsion Stage (2nd stage of Delta IV) so that SLS can go from 70 mt to 105 mt, EM-2 with first crew could slip from 2021 to 2023, this may help prevent it, Commercial Crew received its first full funding at $1.244B, earlier only $700M-$1B was to be provided, now might meet end of 2017 date, Planetary Sciences gets $1.631B an increase of $270M over WH which will save Opportunity rover and Lunar Reconnaissance Orbiter, $175M to plan for Europa mission is 2020’s with a lander and orbiter, JWST fully funded at $620M to keep on track for 2018 launch. 2016 final budget out for only a couple of weeks and now WH has submitted 2017 budget is here. Total for NASA is $19B which is a bit down from 2016. Congress still at odds on earth monitoring satellites and they say that SLS/Orion is being gutted. $8.4B for manned space with ISS taking $5B, Space Technology & aeronautics get $800M each. Looking at Planetary Society comments on 2017 budget, this is 5th time Planetary Science has been cut but it is highest WH ever gave them at $1.52B, Europa only $50M vs $175M given by Congress in 2016 & estimates late 2020’s on Atlas rather than SLS, $5.6B for Science Directorate (Earth science cracks $2B for first time, Astrophysics gets $52M increase, Heliophysics gets $700M with Solar Probe Plus on track for 2018 launch, JWST gets $570M with primary mirror assembled, Solar Electric Propulsion gets $66M, Human exploration gets $3.3B, Commercial cargo & crew moved into space operations ($1.3B for SLS, $1.1B for Orion, eyebrow raising decreases from $2B for SLS in 2016), space operations gets $5.08B, commercial cargo & crew get $2.76B, ISS $1.4B, Asteroid ReDirect Mission gets $57M with 3 year slip to 2023, nice chart that helps compare 2016 to 2017 (in the chart PBR is Presidential Budget Request). The main topic for the night was the discovery of Gravitational Waves. LIGO discovery of gravity waves – best is 6 min intro video “LIGO detects Gravitational Waves”; also a nice 25 min video “LIGO generations” showing scientists and science center, probably seeing who will receive Nobel prize, very international, good explanation of what they are doing, amazing that they have been working for 19 years on it. Signal from 2 merging stellar black holes (29 & 36x suns mass within 93 mi diameter) 1.3B ly away. The black holes collided at half the speed of light and an estimated 3x mass of sun was converted into gravity waves over 20 milliseconds with a total power output in gravitational waves during that time of 50x greater than all the power output of all the stars in the universe. Einstein is amazing because he effectively working alone on his theory, whereas the LIGO paper listed over 1000 researchers. Gravitational waves will let us probe even before CBR emitted 380,000 years after the Big Bang and determine whether the “inflation era” truly occurred. During discovery LIGO was only operating at one third of its new design sensitivity, On web site the video “journey of a g-wave” is also good. From last month I had these notes. LIGO (Laser Interferometer Gravitational Wave Observatory) reopens search for gravity waves – rebuilt in Livingston, Louisiana and Hanford, Washington, 3x more sensitive now and 10x soon (ALIGO) (looking for signal 1000x smaller than a proton, can do 10x that accuracy), 900 scientists, looks for the stretching of space-time in 2.5 mi long arms at right angles with precision of 10^-19 meters or billionth of width of an atom, must damp out vibrations in the environment, looking for pair of neutron stars spiraling toward each other, original cost $620 million. The experiment ran 2002-2010 and could detect up to 65 million ly, new advanced LIGO should eventually detect out to 650 million ly, a volume 1000x original. Right now they can see out to 200-260 million ly, optimistically see 3 occurances in 3 months, pessimistically might take 600 yrs to see one. Europeans have VIRGO detector near Pisa, Italy. Every time a new region of the spectrum opens up, all kinds of new discoveries are made. General Relativity is now 100 yrs old. They did try to look for visible light signal but the area of detection was 700 square degrees area (2800x the area of the moon). TED talk very informative too. I wanted to include one more topic. Even though we didn’t get a chance to discuss this topic, I wanted to include it in case Audrey, the daughter of my nephew Shaun, was still doing research on the dwarf planet Pluto. It was very rewarding to show them the pictures under the section of the web site under our Plutopalooza Party topic. And I hear she was impressed that there was a “co-founder of MASS” within the extended family. I hope these links to Pluto give her a better appreciation for the varied surface of that small world. Pluto Map with proposed names – Kevin had shown the map at SkyWatch, I was hoping Kevin would come to MASS to help us pronoun this area, Cthulhu. It named after an underworld being of H.P. Lovecraft (a great, old winged deity with tentacles on his face in horror fiction). Size of Pluto and Charon compared to earth. You get an appreciation for the smallness of Pluto with this picture. Earth thru Pluto in solar system bodies; At start of 2016, New Hprizon is 125 million miles past Pluto, still traveling at 31,000 mph. X marks the spot. Sputnik Planum is made of nitrogen ices that bubbled up like a lava lamp from below, the “x” marks spot where 4 convective cells meet. The dark patch to x’s upper left is a dirty chunk of water ice floating atop the sea of nitrogen ice. The little holes in the surface are cool too. Hills of water ice floating on top of nitrogen ice cells tend to migrate to the cell boundaries. For the next meeting’s main topic, Keith will present his article soon to be published in the National Space Society newsletter “Ad Astra”. I not sure the exact title but it has to do with colonization of outer space. For a future summer meeting, Dean will give us all the details concern the Juno mission that will go into orbit around Jupiter on July 4th.